HOW TO SOLVE CAT LITTERBOX PROBLEMS. With careful analysis of the cat’s environment, specific factors can usually be identified which have contributed to the litterbox problem. The suggestions in the following article can help you get problems solved. Housesoiling is one of the most common behavior problems in cats. It is normal for cats to have surface and location preferences for where and on what they like to eliminate. It’s only when these preferences include the laundry basket, the bed, or the Persian rug that these normal behaviors become problems. With careful analysis of the cat’s environment, specific factors can usually be identified which have contributed to the litterbox problem. Cats don’t stop using the litterbox because they are mad or upset and are trying to get revenge for something that “offended” or “angered them” – that is a myth. Because humans act for these reasons, it is easy to assume that cats do as well. But cats, or other animals, do not act out of spite or revenge, so it won’t help to give your cat special privileges and hope she’ll start using the box again. If you’ve had your cat declawed, that is not likely to be the cause of the problem either. Studies show that declawed cats are no more likely to have litterbox problems (or to bite) than are cats with their claws. “Stress” (a term that has many meanings) is not often the reason a cat stops using the litterbox. If stress is involved, you should see other behavioral or physical changes as well, such as, weight loss, fearful behavior, or changes in eating or sleeping habits. Punishment is not a way to resolve a litterbox problem. First, check with your veterinarian. Health problems can cause litterbox problems. Cats don’t always act sick, even when they are. Only a trip to the veterinarian for a thorough physical exam, which may include a urinalysis, can rule out a medical problem. If your cat is given a clean bill of health by your veterinarian, the next step is to determine whether your cat is spraying or urinating outside the box. Spraying is urine marking behavior, and is a cat’s way of indicating ownership of her territory. Marking is triggered by the presence of other cats. It can occur because neighborhood cats are “hanging around” outside, or because of conflicts between cats in a multi-cat household. Unfamiliar objects, smells, or people in the house can also cause the behavior. Spraying has nothing to do with litterbox habits. 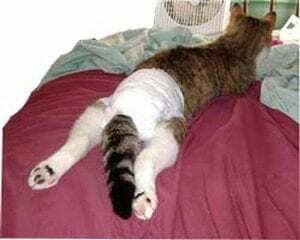 When a cat sprays, she stands up, backs up against a vertical surface and deposits urine at “cat height” against curtains, doors, walls, furniture, etc.. Her tail may quiver and she may alternately lift her hind feet while she sprays. Male or female, spayed or neutered cats of any age may spray, although the behavior is more common in unaltered males. Discouraging the presence of neighborhood cats. Try blocking off windows from where your cat can see neighborhood cats. Discourage their presence with aversive odors. Resolving conflicts between cats in the household. If family cats are fighting or skirmishing with each other, you’ll need to help them get along better. Make sure good things happen to each of them in the presence of the other. Punishing the cats is likely to make the problem worse. You may need to separate them temporarily while working on the problem. Talking to your veterinarian about possible short-term anti-anxiety drug therapy. Make the sprayed areas less attractive by using No-P™ Housebreaking Aid. 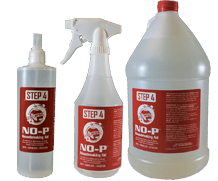 The No-P™ Housebreaking Aid eliminates urine and feces scent so your cat will not re-urinate or re-defecate in same area after cleaning! If you are finding puddles of urine or feces on the floor, then your cat is choosing not to eliminate in the litterbox. The most common reasons why cats stop using the litterbox are an aversion to the box, surface preferences, location preferences, or a combination of all three. You’ll need to do some detective work to determine the reason for your cat’s change in behavior. This means that your cat has decided that the litterbox is an unpleasant place to be. The box may not be clean enough for her, she may have experienced painful urination or defection in the box, she may have been startled by a noise while using the box, or perhaps she has been “ambushed” while in the box by either another cat, a child, a dog, or even by you if you were attempting to catch her for some reason. This kind of an aversion may require you to completely replace the litterbox so it no longer reminds your cat of unpleasant experiences. You may need to buy a new box, put it in a new location and use a different type of litter. Remember to keep the box clean – scoop out feces ever day, and completely change the litter anywhere from every three days to once a week. All animals develop preferences for where they like to eliminate. These preferences may be established early in life, but they may also change overnight for reasons that we don’t always understand. 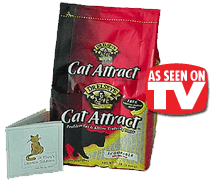 If your cat often reaches out and scratches the carpet after she uses the box, she may come to prefer to use the carpet instead of the litterbox. Many cats seem to develop a preference for either soft surfaces such as piles of clothes or the bed, while others may prefer slick surfaces such as the bathtub or the kitchen sink. Cats with an outdoor history may prefer dirt or grass. To resolve a surface preference problem, the material in the litterbox needs to be made less attractive. For example for a soft surface preference, try the new fine-grained, clumping litter. If your cat has been using the bathtub, spray with No-P™ Housebreaking Aid and give her a slick surface in the litterbox by placing very little if any litter in the box. If your cat has been outside, try generic potting soil in the box. Your cat may decide that she likes to eliminate in a particular location. Maybe her preference is for a quiet, protected place such as under a desk downstairs, or in the closet. She may like to go in location where the litterbox was previously kept, or maybe where a particular odor is located. Location preferences can be dealt with by moving the box to the preferred location, leaving it there until your cat uses it consistently for several week, and then VERY GRADUALLY moving it back to where you want it to be. If your cat does not use the box when you move it, then it is not a location preference problem. Soiled areas can be made less attractive by cleaning them. Be sure you REMOVE all of the urine out of the soiled areas, don’t just cover the urine up with odor masking products. Clean the areas thoroughly. Make the carpet or soiled surfaces less attractive by covering them with double-sided sticky tape, plastic, or a vinyl carpet runner with the point side up. Give the areas an unpleasant smell by spraying the plastic, or vinyl carpet runner with No-P™ Housebreaking Aid. When sprayed on the soiled area, No-P™ Housebreaking Aid will eliminate the urine scent so your pet will not re-urinate in that area. We strongly advice that you REMOVE the urinated areas in your carpet using a DRY powder. This will allow you to REMOVE the old urine (and stains or odors) deep in the carpet, WITHOUT causing the urine to penetrate deeper into your carpet and padding. After you have treated these areas and removed the old urine (and stains or odors), you may THEN have your carpets professionally cleaned by alternative carpet cleaning methods. a) Use our Basic Stain Remover System if stains are your biggest concern. b) Use our Ultimate II Stain & Odor Remover System or The Godzilla Buster if odors are a concern. We include a FREE blacklight with each System. The blacklight is used to locate urine odors.